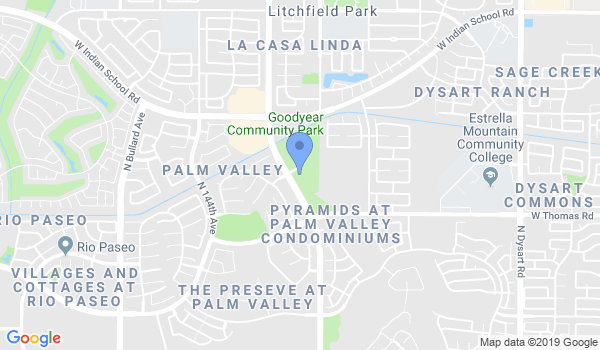 Simba Dojo Shotokan Karate is located in Goodyear, Arizona through the Goodyear Parks and Recreation Department. Classes offer a great introduction to traditional Japanese / Okinawan martial art of Karate. We are family oriented and accept students of all ages. For more information see our website at: http://www.simbadojo.com or email us at sensei@simbadojo.com. Sundays: 4 to 5 P.M.
Mondays: 6 to 7 P.M.
You must pre-register or make an appointment before coming to class. Would you like more information on hours, classes and programs available at Simba Dojo, Goodyear Shotokan Karate? Please contact the school with your questions. Update the details, Write a Review or Report Error of Simba Dojo, Goodyear Shotokan Karate.